How to split PDF which has different text in the same specified to small PDF files? Is there a tool to split PDF which has different text in the same specified to small PDF files? I would like to split my invoice PDF file based on the order ID. Can you recommend me a tool and tell me how to make it? According to your need, I think A-PDF Content Splitter is the tool what you need. 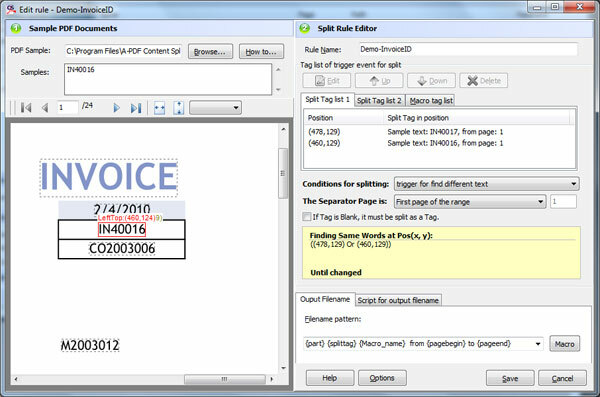 A-PDF Content Splitter is the ideal desktop application for splitting PDF based on your order ID/invoice number and so on. Now read on the below article to split your PDF into small PDF files based on specified position or text. 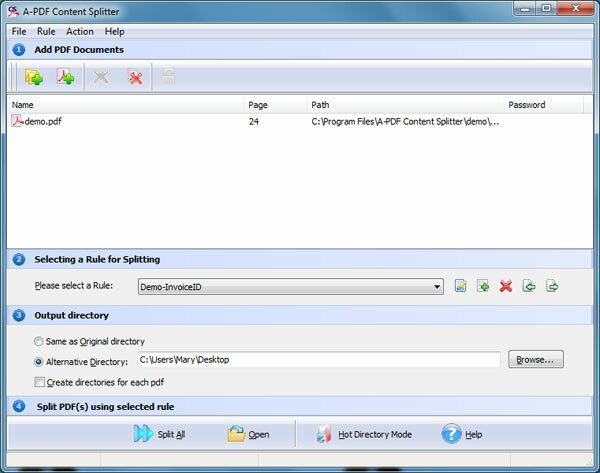 Purchase the standard version of A-PDF Content Splitter and then install it to your computer, compatible with Windows 2000/XP/Vista/7. Split All based on your split rule.